On May 19, 1989, as the Calgary Flames took to the Forum ice for the third game of the Stanley Cup Finals against the Canadiens, Larry Robinson was doing the same for his 200th career playoff appearance. Playing in the postseason for a 17th spring in a row, Robinson became the first NHLer to reach the milestone. He was the only one to do it with the same team before Nicklas Lidstrom joined him in 2008. The Canadiens played three more games before watching the Flames lift the Stanley Cup in celebration following their six-game victory. 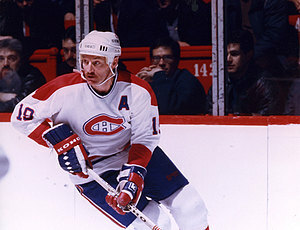 With 203 postseason games on his permanent record, Larry Robinson is the Canadiens all-time leader in that category. A member of the Los Angeles Kings for the next three seasons, “Big Bird” took part in the playoffs every year, setting an NHL record by appearing in the postseason in 20 consecutive seasons.